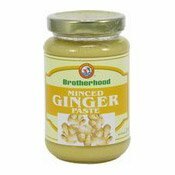 Description: Brotherhood Minced Ginger is from peeled and chopped fresh ginger with original flavour and texture. Simply add the required amount direct from the jar. Ingredients: Ginger(80%), Water, Rapeseed Oil, Sugar, Salt, Acetic Acid, Antioxidant: Ascorbic Acid. Simply enter your details below and we will send you an e-mail when “Minced Ginger Paste (兄弟姜蓉)” is back in stock!